Our secure messaging is fully HIPAA-compliant and quick to perform! PowerMD’s secure messaging features allow for quick message composing, sent messages view list, message inbox, and the trash. All the messages follow an encryption method achieving the highest level of security. The fully secure messaging feature is an efficient way to cut down, if not entirely eliminate, the practice’s reliance on paper, fax, or even phone communication methods! 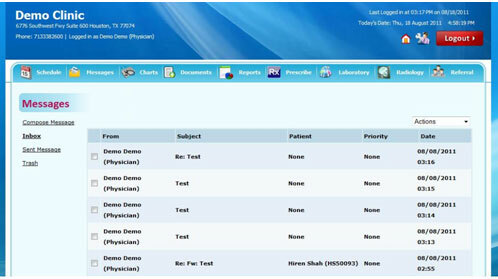 Also, a fully secured messaging feature can be integrated into the EHR with lab results, patient charting, and more. The overall benefit of a fully secured messaging feature goes beyond the security! Fully secured messages can be linked to individual patients for purposes such as billing, activity tracking, and even auditing. In the end, a fully secure messaging system can be a great way to compose, track, and print patient-related messages.